Porte renaissanceThe mason become a castle-owner restores alone this building since 1998. “Mons Regalis” the royal mount (because its dominating position, puts up at 289m high, its donjon dating from the end of the 12th century. The only witness of this time in this country and its castle dating from the 13th and 16th centuries. With its magnificent inner Renaissance courtyard, its mullioned windows, hanging balconies, gread screw staircase and vaulted rooms, Montreal is one of the best fleuret of the castral crown of Largentiere, with the castles of Brison, Chassiers, Tauriers, Fanjau (destroyed) Vinezac and Uzer, it kept watch over the silver mines of Largentiere. 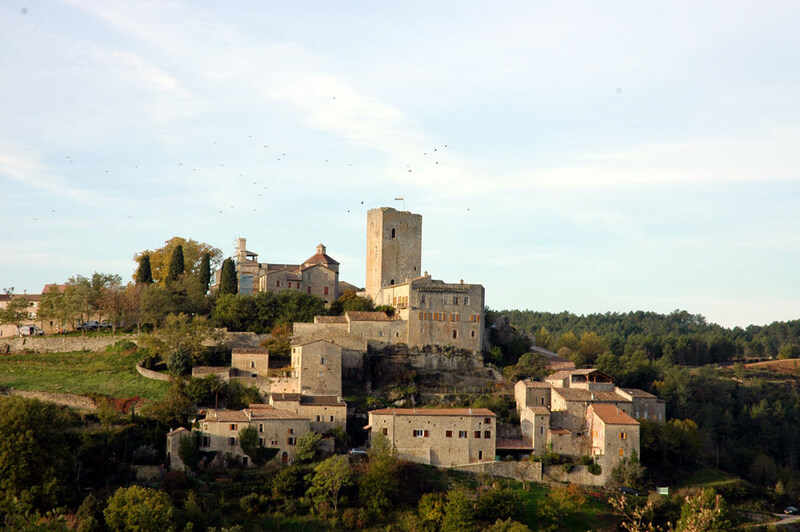 The bishops of Viviers, Lords of these mines stroke coins in the Middle Age. From the 13th century to the 19th century several states can be identified. Belong to the first state the 23 meters donjon a narrow masonned mantle-wall and a seigneurial home (aula). Nowadays, the present owner, Hubert Fenestrier, a mason, fascinated by old buildings, patiently, lonely restores this building in order to open it to visitors. In summer, medieval animations are set up : theatrical visits, medieval costumes and workshops can help you to discover the medieval know-how and manners.